No sooner had the Japanese surrendered than these stamps careened headlong into another armed conflict, one that would end up killing over a million more people (Kaprindo 1996). 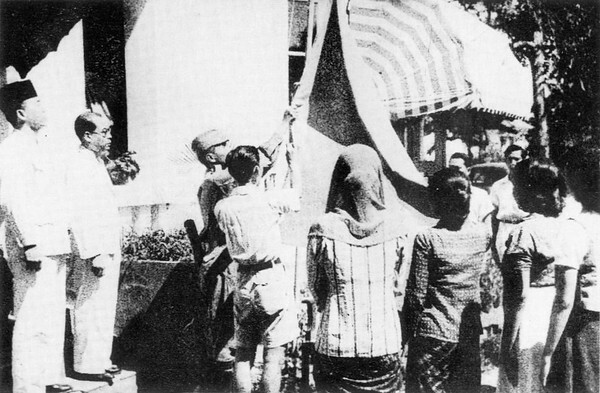 Proclamation of Independence by Sukarno and the hoisting of the Indonesian flag, 17 August 1945. The historic event took place prior to the formal surrender of Japan in World War II, following a promise by Japan in 1944 to grant independence to Indonesia. Source: National Library of Indonesia. 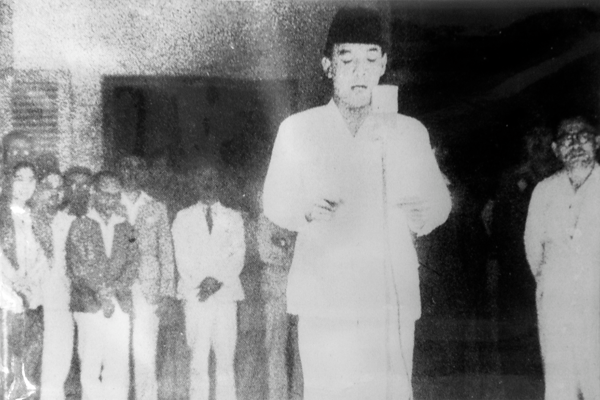 The War of Independence in Indonesia was triggered by the Proklamasi Kemerdekaan Indonesia (Proclamation of Indonesian Independence) on 17 August 1945 by Sukarno and Mohammad Hatta. Subsequent Dutch military intervention led to a prolonged spate of bloody standoffs as the colonial power struggled to regain control over the vast and sprawling archipelago. It was only in 1949 that the Dutch finally caved in under mounting international pressure to recognize Indonesian independence. 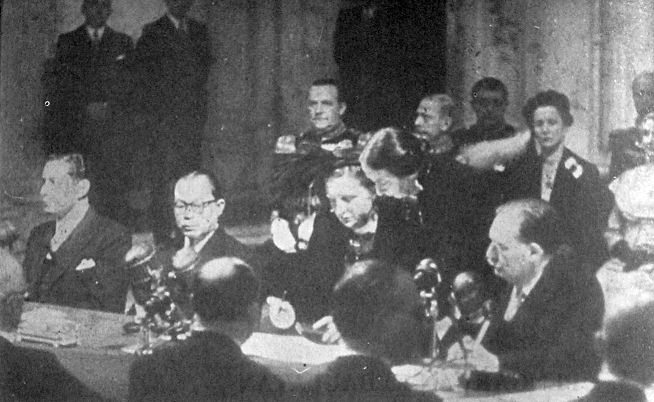 Queen Juliana of the Netherlands formally recognizes Indonesia as a sovereign state at the Koninklijk Paleis Amsterdam in the presence of Indonesian vice-president Mohammad Hatta on 27 December 1949. Source: Information Ministry, Indonesia. The revolutionary period from 1945 to 1949 thus saw, unusually, two postal jurisdictions operating simultaneously in one country: the Dutch jurisdiction which issued stamps of the Netherlands East Indies, and the so-called republican one, DJAWATAN PTT, which issued stamps either overprinted or of their own new designs in their strongholds of Java and Sumatra (Kaprindo 1996). Many different republican overprints were used on different islands, partly due to the Dutch military blockade hindering the coordination of stamp issues across the republican-administered provinces (Kaprindo 1996). These overprints saw the very first use of the word 'Indonesia' on postage stamps. As usual, forgeries occur (Bessels & van de Loo 2001). 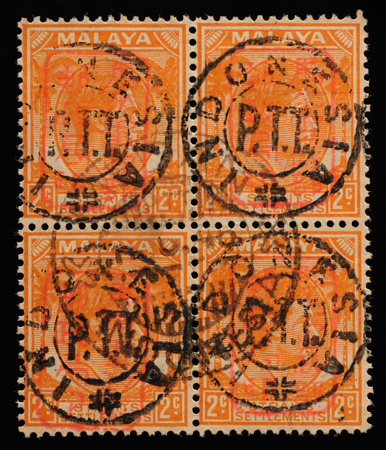 The PTT Indonesia ('postal, telegraph and telephone service') medium-sized circular handstamp of 1945 (Kaprindo 1996 catalogue number S.T.2.21) was endemic to north Sumatra and its vicinity. The distinctive cross at the bottom of the handstamp is recognizable as a Dutch East Indies design motif widely used on pre-war datestamps. 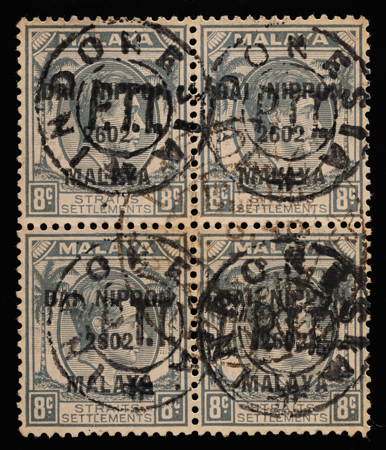 The embroilment of Malaya stamps in Indonesia's revolution is highly fascinating but rarely noted by philatelists specializing in Malaya. These militarized stamps carry two different overprints from two different foreign countries. The example above includes the Japanese single-frame overprint. 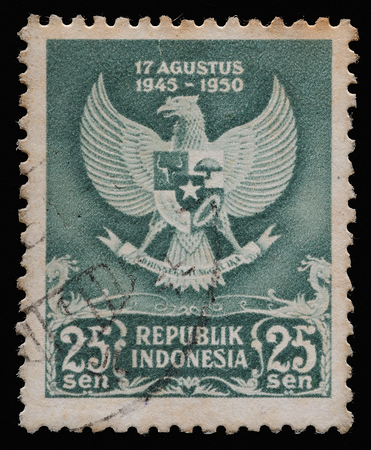 The block carries the new post-war republican datestamp from Medan, capital of north Sumatra. PTT Indonesia handstamped overprint on top of the DAI NIPPON 2602 MALAYA Japanese occupation machine overprint. These hybrid stamps, which bear the scars of two wars, often evade the radar of philatelists because they do not appear even in the specialized catalogues of the original issuing country of the stamp, and get unillustrated passing mention, if at all, in the catalogues of the overprint country. Independence at last. Commemoration of the fifth anniversary of the Proclamation of Independence, featuring the Garuda Pancasila, national emblem of Indonesia. Ironically, this stamp has a pre-war Netherlands East Indies postmark.